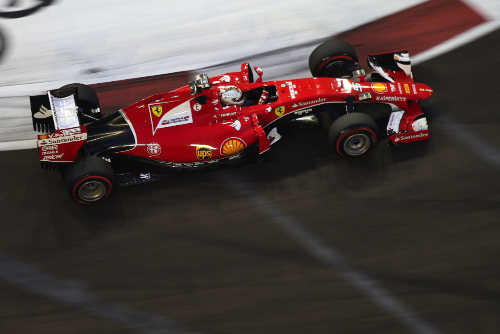 Sebastian Vettel took a flag-to-flag victory at the Singapore GP tonight in his Ferrari over the Red Bull-Renault of Daniel Ricciardo - 1.4 seconds behind, and the second Ferrari of Kimi Raikkonen in third place 17.1 seconds behind the leader. The win is Vettel™s third of the season for Ferrari and it moves him into third on the all-time wins list, with 42 victories, ahead of Ayrton Senna with 41 wins. Nico Rosberg (24.7s) finished in fourth in the Mercedes GP, followed by Valtteri Bottas (34.2s) in the Williams-Mercedes in fifth place, Daniil Kvyat (35.5s) in the second Red Bull in sixth, Sergio Perez (50.8s) in the Force India-Mercedes in seventh, Max Verstappen (51.4s) in the Toro Rosso-Renault in eighth, his team mate Carlos Sainz (52.8s) in ninth and Felipe Nasr (90.0s) in the final points paying position in tenth place. Before the start the drivers got ready to contest one of the hottest races on the F1 calendar with Vettel on pole next to his former team mate Ricciardo on the front row, followed by Raikkonen and Kvyat on the second row, Hamilton and Rosberg on the third row, Botttas and Verstappen on the fourth row and Massa and Grosjean rounding out the top ten grid position. Rosberg is having a problem with his start proceedure and is unable to drive around to the grid. The team works on the problem and gets the German on his way. With a safety car getting called in each of the seven prior events, expect another one tonight. Pirelli expecting the race to be to run with a three-stop strategy, running the super soft tyres first, and the soft tyres for the last segment. For the first time since 2007 an American driver will start a grand prix with Alexander Rossi driving for the Manor team. With the start approaching the temperature was 29 degrees, the driver will face a gruelling two hour challenge tonight. The field makes it way around the circuit on the formation lap with Vettel leading the way. The cars form up and the lights flash off and the race begins, with Vettel taking the lead, with Ricciardo, Raikkonen, Kvyat, Hamilton and Rosberg, Bottas and Massa following. Verstappen stalled on the grid and is pushed away with his Toro Ross stuck in first gear. The team gets him started and he is at the back of the field. On lap 2 Vettel sets fastest lap at 1m51.623 seconds and has a 4.3 seconds lead over Ricciardo. Rossi passes his team mate for 18th place. Bottas is hounding Rosberg for sixth place. Mercedes is debating whether Rosberg has any debris caught in the brake duct. On lap 6 Button reports that his rear tyres are overheating. Sainz and Grosjean chase Alonso for 11th place. Perez complains to his team that he is faster than his team mate Hulkenberg in ninthe place. On lap 7 Vettel had stretched his lead over Ricciardo to 4.7s and now the Australian has started to match Vettel™s pace. On lap 10 Grosjean pits for soft tyres. Alonso, Sainz, Ericsson and Maldonado all pit the next lap. At lap 10 Vettel leads Ricciardo by 4.3 seconds, followed by Raikkonen (6.6s), Kvyat (10.1s), Hamilton (12.5s), Rosberg (16.0s), Bottas (18.5s), Massa (20.7s), Hulkenberg (22.8s) and Perez (24.5s) in tenth place. On lap 13 Kvyat pits, along with Massa. When rejoining the race Massa makes contact with Hulkenberg in the first corner and Hulkenberg ends up in the barrier and is out of the race. The virtual safety car is deployed and most drivers pit. Button has a nearly one minute stop with an issue putting on the tyres. The real safety car is deployed, while track cleanup continues. On lap 15 under the safety car Vettel leads Ricciardo, Raikkonen, Hamilton, Rosberg, Kvyat, Bottas, Perez, Nasr and Grosjean in tenth place, followed by Alonso, Sainz, Maldonado, Massa, Ericsson, Button, Rossi, Stevens and Verstappen in 19th place. Under thr safety car on lap 17 Verstappen is allowed to unlap himself from the field. The lights on the safety car go out and it pulls into the pits at the start of lap 19 the race resumes with Vettel continuing to lead. Sainz has touble with his gearbox and falls back to 17th place on the restart. At lap 20 Vettel leads Ricciardo by 0.9 seconds, followed by Raikkonen (1.6s), Hamilton (3.4s), Rosberg (4.5s), Kvyat (5.2s), Bottas (6.4s), Perez (7,8s), Nasr (9.6s) and Grosjean (10.6s) in tenth place. Kvyat is having issues with his brake temperatures. Kvyat is closing on Rosberg in fifth place. On lap 25 Hamilton, running in fourth place is complaining to the team that he is losing power. Rosberg passes Hamilton for fourth place. Kvyat passes Hamilton as well. On lap 27 Vettel sets fastest lap at 1m50.520s. Hamilton continues to drop down the order to eighth position. Mercedes keeps asking for Hamilton to try reseting settings, but nothing so far has worked. On lap 28 Ericsson and Sainz both pit. Hamilton runs in tenth place - ten seconds a lap slower than the leaders. Massa pits the next lap. At lap 30 Vettel continues to lead, leading Ricciardo by 4.0s, followed by Raikkonen (6.8s), Rosberg (14.4s), Kvyat (16.9s), Bottas (18.9s), Perez (24.6s), Nasr (30.4s), Alonso (31.8s) and Button (40.9s) in tenth place. Hamilton runs in 14th place (60.5s). On lap 31 Massa pits and retires his Williams. On lap 33 Sainz is chasing Ericsson for 14th place. Hamilton pits and the team retires his car. Kvyat and Alonso both pit. Alonso retires. On lap 34 Perez and Nasr both pit. On lap 37 the safety car is deployed, Vettel says œthere is a man on the track. A spectator is seen standing between two corners near the barrier, strolling down the track. Most drivers take the opportunity to dive into the pits for soft tyres and will try to make it through the end of the race. At lap 40, still under safety car, with race control trying to understand if the track is secure, Vettel leads Ricciardo, Raikkonen, Rosberg, Bottas, Kvyat, Perez, Grosjean, Maldonado and Button in tenth. On lap 40 the safety car pulls in and the race resumes. Maldonado and Button are battling - Button™s wing is damaged, and he limps back to the pits. Sainz passes Ericsson. Verstappen chasses Maldonado and passes him, followed through by Sainz. Verstappen sets fast lap at 1m50.298s. On lap 44 Vettel has pulled out to a 2.9 second lead over Ricciardo. Grosjean is being closely followed by Verstappen and Sainz. Verstappen dives down the inside and takes over eighth place. Later in the lap Sainz passes Grosjean as well and takes ninth place. On lap 48 Vettel sets fast lap. Ricciardo goes faster the next lap with a 1m50.118s. At lap 50 Vettel continues to lead Ricciardo by 2.9 seconds, followed by Raikkonen (7.2s), Rosberg (12.2s), Bottas (15.6s), Kvyat (17.9s), Perez (22.8s), Verstappen (24.3s), Sainz (28.0s) and Grosjean (41.9s) in tenth place. On lap 51 Vettel sets fast lap at 1m50.075s. On lap 52 Ricciardo sets fast lap at 1m50.041s and closes the lead to 2.7s. McLaren informs Button to retire the McLaren because of gearbox issues. On lap 55 Nasr passes Maldonado for 11th place. Vettel responds to Ricciardo and stretches the lead to 3.1s. Ericsson passes Maldonado as well. With five laps left Verstappen chases Perez for seventh. Nasr is closing on Grosjean in tenth place. Grosjean gets loose and Nasr gets by for the final point on lap 60. The positions stay the same on the last lap and Vettel takes the win for Ferrari.